There is something perfect about the collision between grilling season with fresh ripe tomatoes and sweet watermelon. Oh yeah, who can forget the forest of basil and mint varieties growing in the herb garden. This salad pulls that together with the most delicious halloumi cheese. 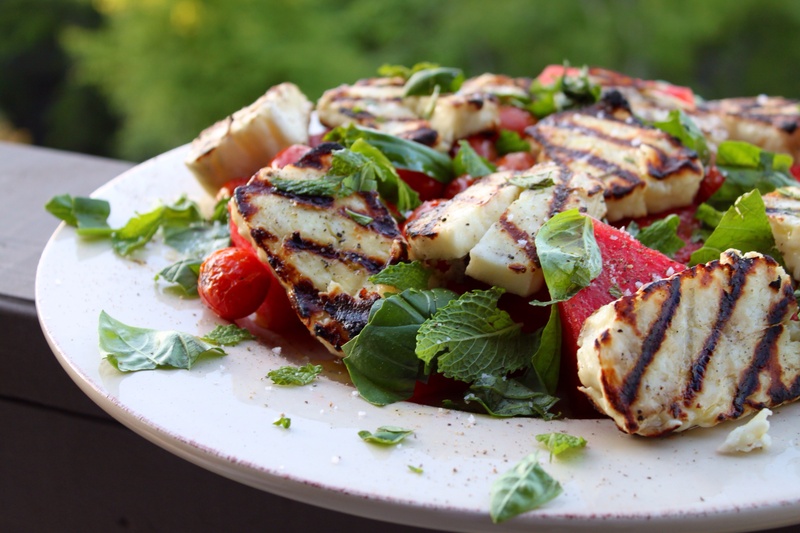 Halloumi, while can be pricey, is something just unique enough to surprise guests with an interesting summer surprise. This was the perfect salad for our Memorial Day celebration. Brush grill rack with oil. Drizzle 2 tablespoons oil over tomatoes and cheese; season with salt and pepper. Grill tomatoes, turning occasionally, until charred and bursting, about 4 minutes. Grill cheese until nicely charred in spots and beginning to melt, about 45 seconds per side. Arrange melon on a platter. Top with cheese and tomatoes. Sprinkle with fresh herbs.